Thank you to all my Freinds and Members who have joined my FB Group. I wanted to try this “Victoria Sponge Cake” since a while but it kept pending. Victoria Sponge Cake is a very English cake with very simple ingredients but if made the right way it is the best cake one can have with or without tea. Its soft and spongy structure and then the Raspberry filling makes it the Top Class Cake! My Mom used to make this Sponge cake at that time when we had no oven and she had this round silver cake form and I remember she used to beat 6-7 eggs for that, the cake seemed so yellow, now I know it was because of the egg yolks, and the aroma of that cake was just awesome. It was *The Sponge Cake* of that time, made on the hot plate (tawa) kept on the stove on a very low heat covered with a thick cloth so it stays warm. Look at that Raspberry jam oooooozing out ...Yummmmmmy!!! Well then I googled to search for this cake and came across this site which was the nearest to the original sponge cake so I just increased my ingredients in grams and followed the rest instructions. 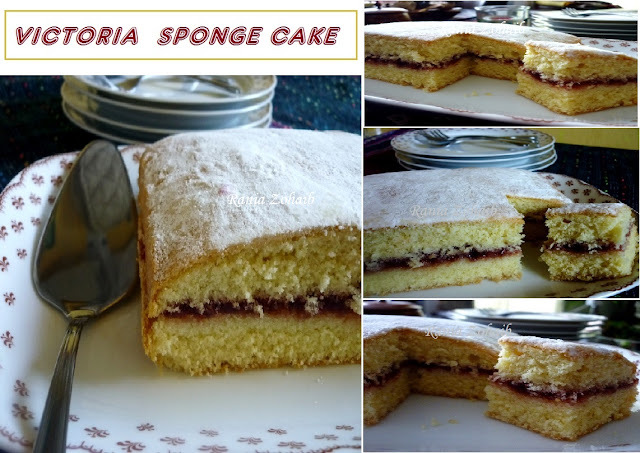 "Thanks a lot to the blog owner for sharing this recipe"
I just made it the classic way with Raspberry jam and castor sugar and it is in fact really very spongy. BUT used a wooden spoon to fold in the mix of flour and baking powder as this is important or you will have thousands of holes on your lovely cake. Do try you’ll love it for sure! Here the steps of making it, copied from "mooeleven.wordpress.com. Exactly the same amount of butter, caster sugar and self-raising flour. (If you only have all-purpose/plain flour, add 1 teaspoon of baking powder [5g] per 100g of flour. Apologies US friends – I think that equates to 1 tsp baking powder for just over 3/4 cup of flour). * Grease and line two 8″ sandwich tins. * Preheat your oven to 160 degrees C (320 degrees F). * Weigh out your ingredients. (Remember, it is the weight of the eggs in their shells you will base your recipe on). So, if you have eggs that weigh 180g, you will need equivalent weights of butter, sugar and flour. * High sift your flour into a clean bowl, twice! * Quickly beat together your eggs in a cup. * In your free-standing mixer, or using an electric hand whisk, beat your butter until pale and fluffy. * Add your sugar and beat. Beat it some more. Beat the living daylights out of it! * Gradually add your eggs, a little at a time. Beat, beat, scrape down, beat, beat and beat. If your mixture curdles, you are being darn impatient! This part takes time, but is vital to a light sponge. Set aside 10 minutes for this part. * When your mixture is ‘together’ and isn’t curdling, high sift your flour into the bowl and, by hand, fold it in. * Spoon the mixture between your two cake tins. For a perfect sponge, weigh the mixture evenly in each tin! Spread it round. * Bake for 20 – 25 minutes until light golden brown. The top should spring back to the touch and the edges should be pulling away from the sides of the tin. * Leave to cool for 10 minutes, then turn onto a cooling rack. * When cool, fill with raspberry jam and sandwich the cakes together. Sprinkle with caster sugar.